Is This the Low Point For Electricity and Natural Gas Prices? 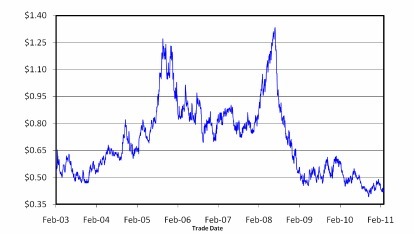 For this two week period of Feb. 25, 2011 to March 10, 2011 prices were relatively flat. Natural gas prices rose 1% and electricity prices rose 2%. Natural gas and electricity prices are range bound as you can see from the electricity and gas graphs included in this newsletter. Gas prices are hovering at this 8 year low and electricity prices are hovering at a 7 year low. Prices continue to hover at this low point because natural gas production is high (thanks to the discovery of shale gas) and demand is low. Energy demand is expected to shrink over the next two weeks as forecasters call for above average temperatures east of the Mississippi for the next 8-14 days. Is this the low point? There are a number of other variables that could start placing upward pressure on natural gas and electricity prices. For example, the instability in the Middle East has caused crude oil prices to rise from $87/barrel to more than $102/barrel. 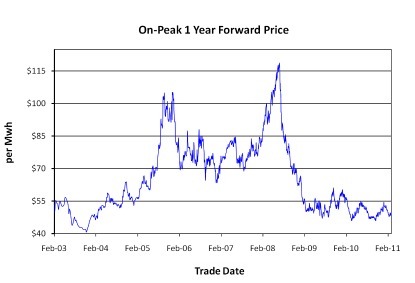 This could start to impact natural gas and electricity prices. Additionally, the low price and abundance of natural gas is causing the US power industry to choose natural gas as the fuel of choice for producing electricity. Increased gas consumption by the power sector could place upward pressure on prices. Is this the low point? This is a good time to look at the early renewal strategy. Storage Update: Storages flipped from a deficit to a surplus this week as a smaller than expected withdrawal was reported this week. This week’s withdrawal was 71 Bcf which was well below last year's withdrawal of 112 bcf . The 5 year average withdrawal was 107 bcf. It is interesting to note that during the month of February, the gas levels shrunk and fell beneath both last year's levels and the 5 year average. However, during the month March, the storage levels flipped from a defict to a surplus. Inventories are now 1% above the 5 year average and 2% above last year’s levels. Weekly Drilling Rig Update: Active rig count released by Baker and Hughes for the week ending 3/4/11 was 899 rigs. This was a decrease of 7 rigs from the previous week. The count is 27 lower than the count reported this same week last year. We are 27% below the 5 year average rig count of 1,226. What Does Henry Hub Mean? Henry Hub refers to a pricing point for natural gas futures on the New York Mercantile Exchange or NYMEX that relates to a particular spot on the natural gas pipeline located in Erath, Louisiana and owned by Sabine Pipe Line, LLC. The important hub connects four intrastate and nine interstate pipelines within the Southern United States.